You’ll find endless ways to fill your time in Jaco with adventure, blissful relaxation, exciting new flavors and unexpected surprises. The toughest part may be deciding what to do first! Here are our tips for what to do in Jaco to make your Costa Rica experience one you’ll never forget. This one’s a no-brainer since you’ve probably been enticed to visit in the first place thanks to Jaco’s famous 2.5 mile stretch of black sand beach. It’s certainly one of the town’s biggest attractions, luring surfers, sunbathers, and water sports fanatics year-round. There are plenty of beach bars, restaurants, and shops lining the beach, too; you could easily spend all day here soaking up the friendly vibe among the surf shops and empanada stalls, and getting lost in the dreamy Pacific views. When you want to get active, try kayaking, swimming, and surfing among those famous waves. It’s not all beach bums and daiquiris in Jaco. Costa Rica is a great place to try white water rafting, an activity sure to get your pulse racing. Thanks to the mountain ranges crisscrossing the country and those tropical rains, a network of bustling white-capped rivers rush along between dramatic peaks, providing thrilling locations for a fun test of your bravery. With its close proximity to Jaco, you’ll be back enjoying a well-deserved drink by dinnertime. Discover your inner explorer at this protected nature reserve packed with guided adventures, located just a short drive from Jaco Beach. Choose from horseback riding, canyon hiking, rappelling or ziplining over waterfalls and jungle expanses. This is another option for those seeking thrills in the great outdoors, something that Costa Rica has plenty of! Even if your go-to vacation position is horizontal on a sun lounger, an eco-adventure in Costa Rica is too much fun to miss. The lush rainforests of the Central Pacific coast make Jaco the perfect base for anyone wishing to explore Costa Rica’s tropical playground. What’s the best way to do it? Ziplining through the rainforest canopy. Check out the locals on your way up, including cheeky capuchin monkeys and colorful macaws. Then prepare to soar like a bird yourself as you fly through the treetops, with expert guided help, and savor the best view in all of Costa Rica. Get off the beaten track – way off – and discover parts of Costa Rica that you wouldn’t find without an all-terrain vehicle. Think rugged mountain trails and hidden waterfalls; then, rewarding yourself for going outside your comfort zone to undiscovered places with a Cerveza served in a rustic bar – it’ll be the best you’ve ever tasted. Jaco is renowned for its nightlife, but it’s not all thumping bass and dancing ‘til dawn (though there’s plenty of that, too). Jaco’s diversity after dark includes excellent restaurants, chilled-out bars pouring perfect mojitos, and places to catch live local music. After a busy day on the adventure trail, a taste of Costa’s Rica’s pura vida is the perfect indulgence. Whether you fancy a packed dance floor, local micro beers or a relaxed place where the locals go, you’ll find your spot in Jaco. Not surprisingly, Jaco’s prime beachside location means the seafood is hard to beat. From fresh gourmet fish dishes to the best street stall fish tacos you’ve ever tasted – Jaco has you covered. But there’s more on offer in its varied eateries. Try the eclectic breakfast menu at Side Street Bistro, a lunch of rice and beans at Soda a Cachete, or Lemon Zest for upscale fusion dining. This is just a start. Come discover your adventurous side – whether that means scaling a waterfall or dancing with a stranger. Lost Beach Tours offers plenty of ways to plan your time in Jaco, or simply follow your heart (or your nose) to your next adventure! 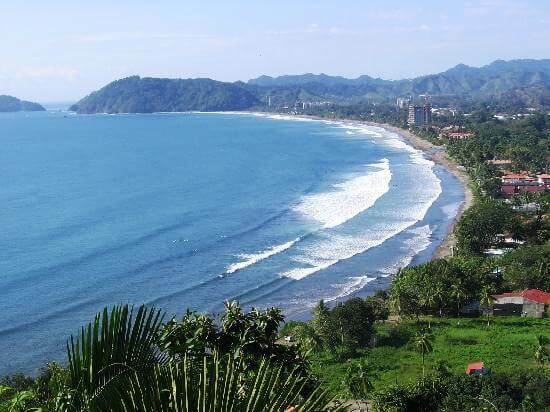 Here’s a destination video about Jaco Beach, Costa Rica.